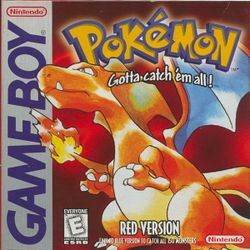 Pokémon Red and Blue were the original releases of the Pokémon RPG games for the Game Boy, and are some of the best-selling games of all time. They were released in Japan in 1996. The Japanese versions were Pocket Monsters: Red and Green. Later that year a third version with improved graphics, Pocket Monsters: Blue Version, was released. The international Pokémon Red and Blue Versions were later released both using the game engine of the Japanese Blue Version but featuring the exclusive Pokémon of the Japanese Red and Green Versions respectively. A digital re-release of Pokémon Red and Blue was launched on February 27, 2016 in the Nintendo 3DS e-Shop, for Pokémon's 20th anniversary of the original Japanese launch of the series on the original Game Boy. Become the greatest Pokémon trainer in the world today! Start your Pokémon Game Boy adventure by choosing a Pokémon at the home of the great Professor Oak, then start your journey to be the greatest Pokémon master! Your mission: Beat the Elite Four and become the Kanto Region's Pokémon Champion, and catch all 151 species of Pokémon. To complete both tasks, you must train your Pokémon, as well as use them to capture other Pokémon. Along the way, many skilled trainers, such as your rival (known as Gary in the TV show, and Blue in the games), Gym Leaders, members of Team Rocket, and many others will challenge you to Pokémon battles. You can't back down, so be ready for anything! Pokémon share many similarities to the animals that we know, but there are fundamental differences you must keep in mind on your Pokémon Journey. To become the Pokémon Champion and collect all 150 species, you'll need to train captured Pokémon so they evolve. For instance, a captured Caterpie will evolve into a Metapod, which will then turn into a Butterfree. Each transformation adds more power to the Pokémon-giving you more power to defeat and capture other Pokémon. Some Pokémon cannot be caught in the game without cheating or trading. For example, Growlithe can only be caught in Pokémon Red, whereas Meowth can only be caught in Pokémon Blue. There are also Legendary Pokémon that can only be encountered once. Newer Pokémon from Generation 2 and later do not appear in this game. Now, go out and become a Pokémon Master! English language boxart for Pokémon Blue version. Japanese boxart for Pocket Monsters Aka version. Japanese boxart for Pocket Monsters Midori version (the original version of Blue). Japanese boxart for Pocket Monsters Aoi version (the Japanese "third" version). Japanese flyer for Aka and Midori versions front. Japanese flyer for Aka and Midori versions back. Japanese flyer for Aoi version front. Japanese flyer for Aoi version back. This page was last edited on 18 October 2018, at 18:01. This page has been accessed 1,388,820 times.